Typically I work in my studio every day. Typically I have the TV on while I work. The week of September 11 wasnt typical. 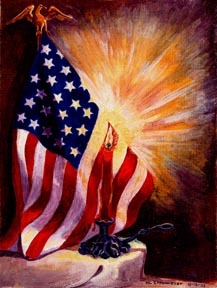 After two days of up to the minute heart breaking television coverage I finally borrowed a small flag, chose a candle and created a patriotic scene. September 11th changed my work. Often when I’m troubled about something I can purge my feelings through my artwork. Upon beginning this series I didn’t know where it would take me or for how long. I began each piece by looking at photographs, searching for the combination of images that would help me express the emotion I was feeling at that time. I never started the next piece before finishing the last one. It wasn’t until July, ten months later and after completing the sixth painting, that my work finally revealed itself as a complete series. 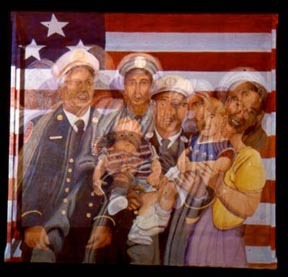 It was my husband who recognized the parallel between the emotions expressed in this artwork and the stages of grief. I was surprised by the comment, because it came before he knew the subject of the seventh painting. Hope is a final stage of grief. I had just decided to end the series with a positive theme. 3-D painting - I have developed a technique I call three-dimensional painting. This allows me to show two images at the same time much like a hologram. I achieve this by making a background painting then suspending screen wire four to six inches over the background. Here I produce the foreground painting of either a complimentary or contrasting image. The results, the viewer can see both images or ideas at the same time. I began this small painting while watching distraught New Yorkers holding up 4 x 6 photos of their loved ones, describing them by height, weight, hair and eye color. Two days later as I added the final details New Yorkers were standing in lines with DNA samples of their missing family members, the mood more somber and resolved, the enormity of this tragedy sinking deeper and deeper into all our souls. 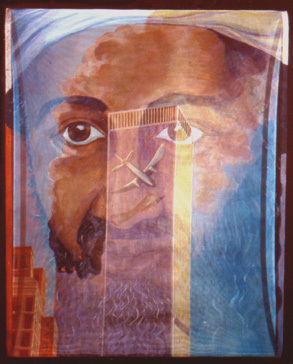 I conceived the idea for this piece and began to work on it about a week after the attacks. 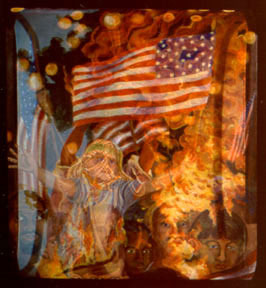 First, I produced a detailed painting of the south tower just after impact while the north tower is burning. In the original plan I was going to put the traditional Uncle Sam pointing his finger in revenge and retribution. During the three weeks it took me to paint the burning towers I learned more about the Afghani people and their plight and poverty. 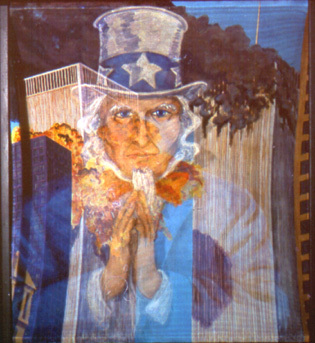 By the time I was ready for the over painting of Uncle Sam I just couldn't paint revenge. So I changed it to Uncle Sam praying for guidance. 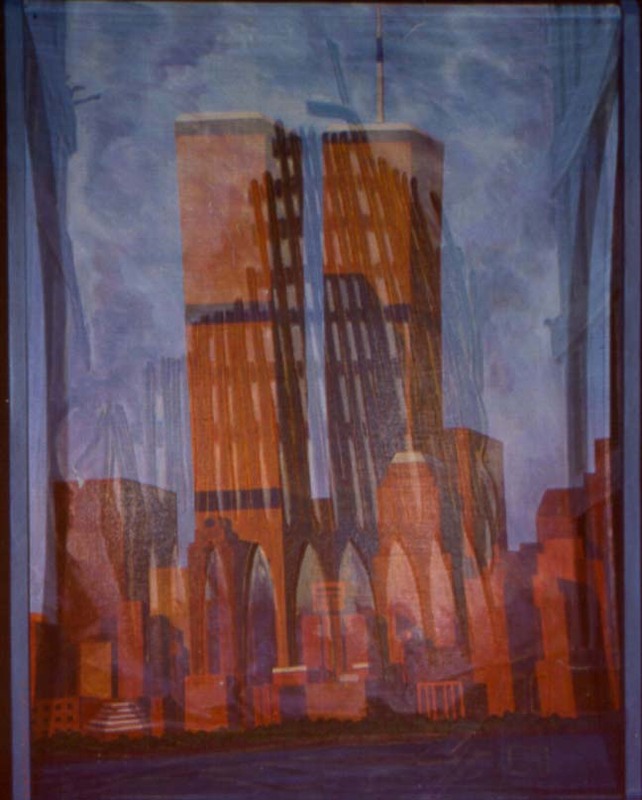 Description of the artwork: Background painting - New York Skyline including the World Trade Center Towers, all painted in shades of red. The tears sting at the back of my eyes. I am consumed with disbelief, sadness and fear of the future of our society. Still with all the horror of it I witnessed an amazing fact. The American spirit couldnt be toppled. I have never been prouder to be an American then I have been since September 11, 2001. What kind of mind devises the use of planes for death and destruction? What kind of a mind can kill civilians including women and children? What kind of a mind doesnt regard his own mens lives? What tragedies will this evil, black-hearted mind devise of next? So many people have been affected by the enormity of this disaster. As time as passed the far-reaching implications of this one event is becoming more and more evident. The Afghani people, many of whom were saddened by the events of September 11th were also full of fear. They wondered "what will the Americans do?" What will happen to them? What will happen to their families? People frightened, people grieving, people starving, people loving each other, people hating each other, people fearing each other. There are so many victims. American History is full of accounts of hate and narrow thinking. Luckily its also full of education, enlightenment, and a slow change to a more accepting environment. I believe that in the Middle East many of the young people are being taught a very narrow set of beliefs. Im afraid they are being taught to hate us. Without changing this practice how will the hate stop? Why did this start in the first place? Why do they hate us? How can we stop the hatred? 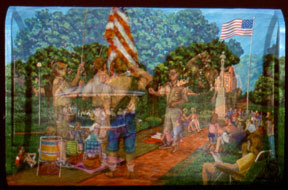 Description of the artwork: Background painting  One of the Woodstock, Illinois, Wednesday night band concerts on the square. The inspiration for this final piece came while attending one of our community Wednesday night band concerts. It was like stepping back in time, neighbors coming together to greet each other, socialize and listen to music while the children run and roll around the grounds laughing and playing. The simple pleasures are part of the American Dream. The tragic events of September 11th have given me a new and continued view of the privilege of living in a free society. Last revised: July 10, 2012.